Much of San Francisco—and Anchor Brewing—history was lost in the 1906 SF Earthquake and Fire. However, a few great resources remain, including old newspapers and city directories. 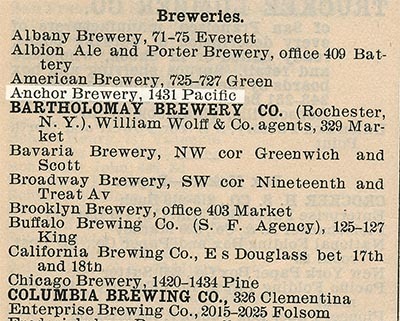 When Fritz Maytag bought the Brewery in 1965, one of the first things he did was go to the San Francisco Public Library, which, to this day, has a near-complete set of San Francisco City Directories. And not just on microfilm or in PDFs—the real thing! 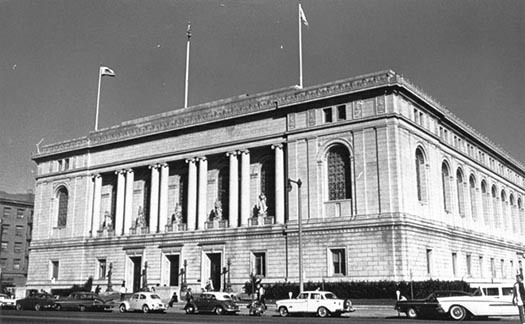 The San Francisco Public Library, circa 1950s. Photo via sfpl.org. He took the 1905 Directory from the shelf. Yep, there was Anchor Brewery. Next, he examined the 1904, 1903, 1902, 1901, and 1900 directories. Still there! With trepidation, Fritz opened the 1899 directory and began his search. Although he’d heard stories, he wanted to confirm what he’d heard once and for all. “Eureka!” he resisted shouting aloud. “I own a nineteenth-century brewery!” Fritz continued back in time until he came to the 1895 directory. No Anchor Brewery. He went back to the 1896 directory. 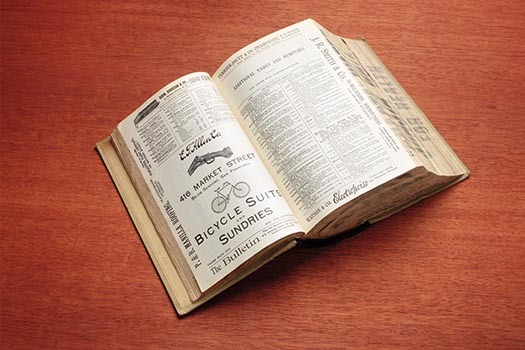 The directories in those days came out on April 1 (no fooling) of each year. Sure enough, there was Anchor Brewery, a last-minute entry in the front of the book under “Additional Names and Removals.” Just to be sure, Fritz checked the Directory’s “yellow pages.” There we were again, under BREWERIES. Confirmation! 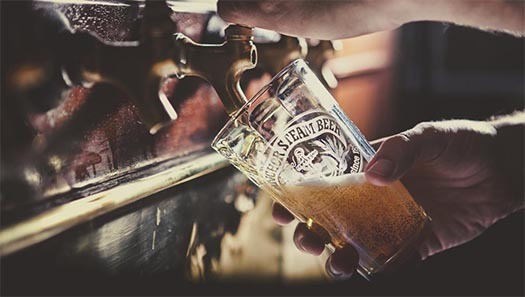 Our Anchor Steam Beer was “Made in San Francisco since 1896,” as Fritz would one day announce on our bottle label. So…. 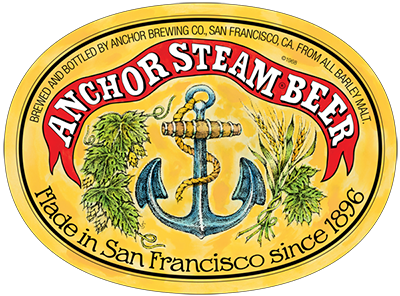 April 1, 1896 is when the good citizens of San Francisco were officially notified that Anchor Brewery per se was open for business. Of course, our brewery had a pre-history. It didn’t just fall out of the sky on in 1896. 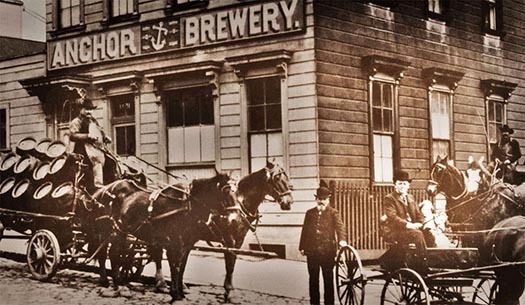 But 1896 is when it became Anchor Brewery. February 27 is also an important day in our history—kind of like a married couple celebrating the anniversary of their first date. 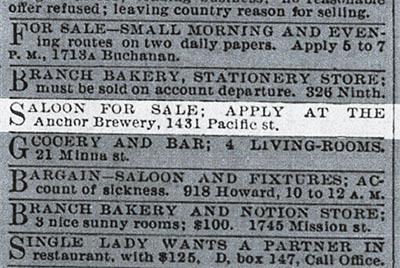 It’s the earliest known mention of Anchor Brewery in a San Francisco newspaper: a small classified ad mentioning that persons interested in a saloon for sale (probably the one next door to the brewery) should inquire at Anchor Brewery, 1431 Pacific. Surprisingly, the ad ran until March 1897! So, on February 27 and April 1, Raise Your Anchor to Anchor Brewery, 1896, and saloons everywhere!